I like Assassin’s Creed for much the same reason that I like Dynasty Warriors: I play these games for their historical setting and narrative, and the actual gameplay is almost a secondary concern. As long as the game is playable - and the Assassin’s Creed games always have been - what matters to me is how interesting the story is that the game weaves around whatever particular period of history that it is focused on. Related reading: Matt's favourite Assassin's Creed prior to Origins was Liberation. Read his full review here. That also means that the Assassin’s Creed games that I enjoy the most are the ones that are centred around periods of history and locations that I find the most interesting. I’ve not been overly keen on the pivot towards Europe over the last two, but I really enjoyed the experimental trilogy of platformers that were released as Assassin’s Creed Chronicles, and were set in China, India and Russia. In that context, Assassin’s Creed Origins is my new favourite of the entire franchise. I absolutely love the aesthetics of the Middle East and North Africa. I love the beauty of the Sahara desert, and the exotic colours and shapes that you find when you come across the rare oasis in the desert. The architecture, clothing and people of these places fascinate me too, and it’s difficult to look past ancient Egypt, as one of the mightiest and most intellectually advanced places in history (relative to the other societies at the time) as one of the most fascinating settings of all for any kind of storytelling. 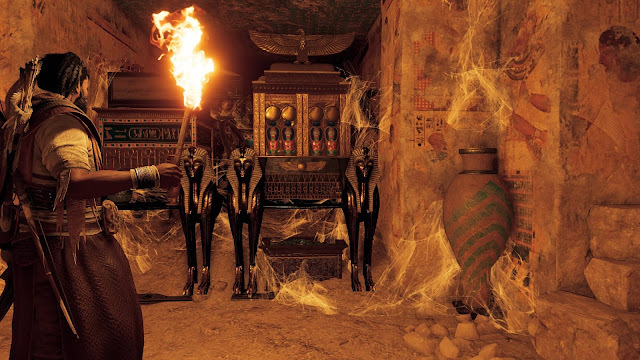 Assassin’s Creed Origins generally does justice to all of that, which is testament to the development team’s capacity for research, and the art team’s eye for detail, and I’ll say upfront that I’ve loved every second of time that I’ve spent in this game simply for how immersive it all is. As for the plot itself, Assassin’s Creed Origins, as the name suggests, takes things right back to the start of the Assassin’s order, and before their nemesis, the Templars, were even called that. 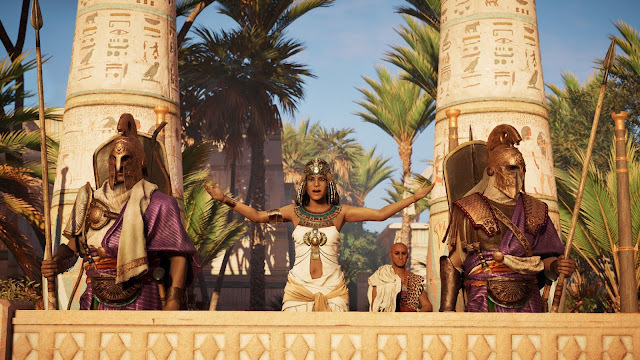 Oddly enough, assassins themselves didn’t exist in real history for roughly a millennium afterwards, but ignoring that one bit of historical inaccuracy for a bit, the game charts the story of an ethnic Medjay (ancient people of Sudan) named Bayek, as his initial quest for revenge against a corrupt and weak king (Ptolemy XIII) gets wrapped in in a world of political intrigue and conflict between the superpowers of the age - Egypt and Rome. Household names from history get name-dropped throughout the adventure (Caesar, Cleopatra), and it's safe to say that Ubisoft has found one of the most unsettled periods of ancient history to set this drama within. Origins is, in every sense of the word, a historical epic. Previous games in the series have certainly leveraged the period of history that they belong to to give players something to explore, but Origins feels, for the first time, like a genuine attempt to tell a story like other great historical epics of literature and film have. I'm referring to the likes of Romance of the Three Kingdoms, Taiko, or War and Peace, which is not to say that Origins tells a story of that quality, but it gives it a red-hot shot, and does it better than any game we've seen before (including the Dynasty Warriors series, which are actual adaptations of Romance of the Three Kingdoms). Bayek is a really wonderful character, but he often feels overshadowed by the grander events at play, and that’s how it should be. A historical epic needs to place its protagonist in the world, but not necessarily have the world bend to him. In film, Lawrence of Arabia was frequently depicted as being downright small on the screen compared to the vast landscapes, and I got a similar sense as I watched Bayek suffer his first hallucination from the sheer heat of the desert. Back in civilisation, there was rarely a moment where there wasn’t something happening around Bayek. A frequent criticism I’ve had of Assassin’s Creed games is that the world around the player feels static and artificial - like everything is simply waiting on the player to take his next action. But with Origins I finally got a sense of a world that was spinning independently of what Bayek was doing (even if practically speaking it was still waiting on his actions). And that, too, is essential in building a good historical epic. Even when one of these stories is largely about one person, it needs to show life going on around that person. In terms of historical accuracy, Assassin’s Creed Origins is, like the others in the series (and indeed the Dynasty Warriors and Samurai Warriors series) authentic without being accurate. Characters are exaggerated (or made up where necessary, including Bayek himself), but events and settings are carefully researched and replicated in the game, to the point that, after playing this game, you’ll be familiar with the stories if you decide to research further. Ptolemy XIII was a remarkably weak pharaoh - mostly because he was all of ten when he assumed the throne. He was also brother to Cleopatra (yes, that one), and at first they jointly ruled, before their relationship broke down, and Cleopatra was exiled. She decided to start a rebellion with Caesar’s help (yes, that one), and that’s more or less where Origins gets the meat of its storytelling from. 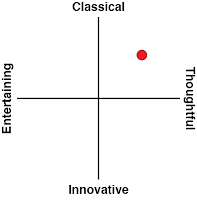 Of course, amongst all that political intrigue and fighting, the common person suffers mightily (and Ptolemy was insensitive to their plight in a way that makes Donald Trump seem like a Che Guevara figure by comparison). This is where Bayek comes in. 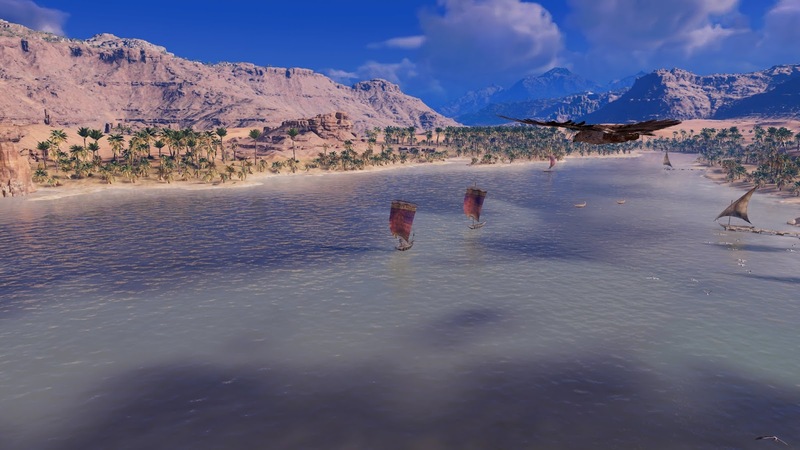 As he gets over his singleminded thirst for revenge he becomes all about helping the people of Egypt weather the political upheavals, whether that be through assassinations, out and out combat, or whatever other bloody activity he can get up to. It’s a barbaric game at times to suit a time where barbarism was par for the course, and all together it’s absolutely incredible to actually explore. I can’t wait for the developers to release the non-gamelike history mode, because as I said, the research that has gone into this game is meticulous, and the way it appropriates that history in a way that remains dynamic and interesting throughout is a masterclass in adapting any material into a video game. This, ladies and gentlemen, is how blockbusters can - and should - balance the desire to tell a story with all the gamey bits that gets the masses to buy the game as a blockbuster needs to. All that being said, there are moments in the storytelling that still make me cringe. So earnest is Bayek about the whole “freedom” thing that I was expecting him to break out into a deep south American accent, or at least transition into Mel Gibson from Braveheart. Ubisoft gets away with it a in this game for the most part because Egypt back then really wasn’t even close to a free place, and when you had poor rulers it was hell on earth. But at the same time there’s a point where the “freedom” cry becomes a bit too fanatical itself, and is used by people to justify taking all kinds of unjustifiable or extreme actions, and the Assassin’s Creed games have regularly tipped into that point where it almost becomes a kind of propaganda of its own. This one is no different in that regard. Anyone who has played an Assassin’s Creed game before knows exactly what to expect from this one. It’s still a game of three fundamental gameplay loops - one where you run around and parkour over, under and through buildings. The second loop is where you sneak around and try to complete missions without bringing an entire army down on you. The third loop is where you do get yourself into a fight with a dozen enemies and need to weave in and out of the melee, countering and avoiding damage while sticking your sword into as many places as possible. These three loops all function much the same as they have in every other Assassin’s Creed game. 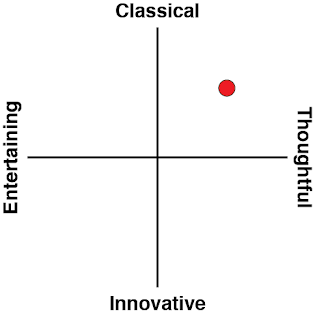 But there are also substantial improvements. Level design makes stealth more interesting and varied now. There’s generally a couple of different ways to stealth your way to a key target, whereas in the past you needed to follow a very specific path. Combat is far more fluid and exciting, and, again, varied. Most long-time fans of the series would know just how static and repetitive combat in the early games could get, but here there’s a brutality and speed to it all that makes it quite exciting. 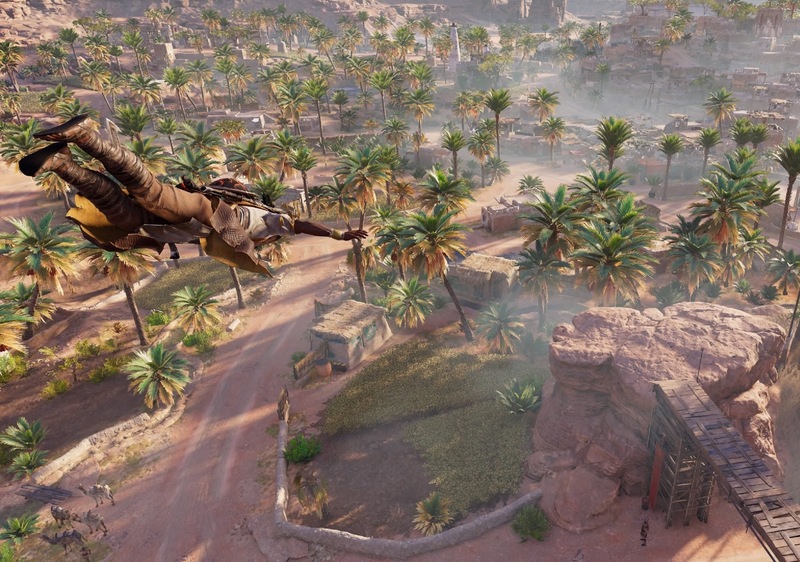 Assassin’s Creed Origins is still an open world title, and that means it has an obsession with making players chase icons in a way that I maintain is closer in effect to work than it is to entertainment. At the same time, the balance between icons that exist simply to force players to play for longer (collecting useless trinkets scattered around the map, for example) and spots on the map with actual storytelling is far better. It would seem that Ubisoft paid close attention to the way that The Witcher 3 worked really hard to make each event add to the overall story, and emulated that. It’s a big, big step in the right direction, even if there are still a couple too many “hidden” treasure chests to track down. This Assassin’s Creed also has an experience and loot system pulled straight from every other big budget loot system, and I blame Destiny for them all. Every enemy that Bayek comes across has an experience level printed boldly above their head. 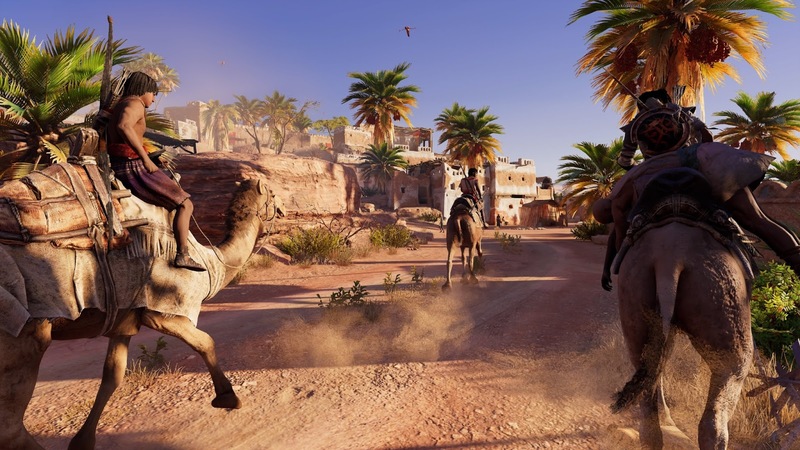 Any enemy two or more levels higher than Bayek can be reliably expected to win a battle. Unless, of course, you’ve got really good equipment. Enemies regularly drop equipment, and there’s plenty of options to upgrade and reinforce that loot so it’s even more effective in combat. Plenty of the loot has additional powers, too, like the ability to poison enemies and so forth. Bayek also has a full skill tree that you can unlock new abilities from as he increases in levels. This way there are plenty of different ways to customise your character, and how you approach challenges will shift dramatically depending on which skills you unlock. For me, I like playing a really nasty stealth game, and my favourite trick is the ability to poison an enemy body and wait for it to infect all the other enemies around it. Chemical warfare of the most grotesque kind, but very effective. That being said, I’m not entirely sure I’m on board with Assassin’s Creed’s giant shift towards being the newest big budget RPG franchise. It works as well as any blockbuster with loot and experience point loops works, but all those mechanics keep pulling the player’s focus away from the world they’re in. Say what you want about previous games, but progress through them was far more organic, and it kept people's attention firmly on the world, narrative and characters themselves. I didn’t need to get Aveline up to level 15 to unlock her gentlelady costume and flirting ability in Liberation. That's really how it should be for this kind of game. But, as I said at the start, I don’t really play an Assassin’s Creed game for the gameplay, and as long as it’s functional and clean (as is the case here), I tolerate it. Beyond the history and setting of the game, which I’ve already described in-depth, I am also quite in love with the production values. I’m not just talking about how it looks like it cost dozens of millions of dollars to create (though it certainly does). What I found so utterly enrapturing about Origins is how perfectly it nails the aesthetics of a very hot, deserty nation. And of how it uses the unmistakable and beautiful instruments of the Middle East to further enrich the scene. After all, if anyone remembers the history of the Assassin’s Creed franchise, it was in many ways a way for the developer to build on what the Prince of Persia franchise had become, but further modernise it and introduce a new and more versatile IP into the market. As someone who also loved the fantasy Persia depicted in Prince of Persia, I’ve been itching for games that make use of that sandy aesthetic and Middle Eastern strings and woodwinds. 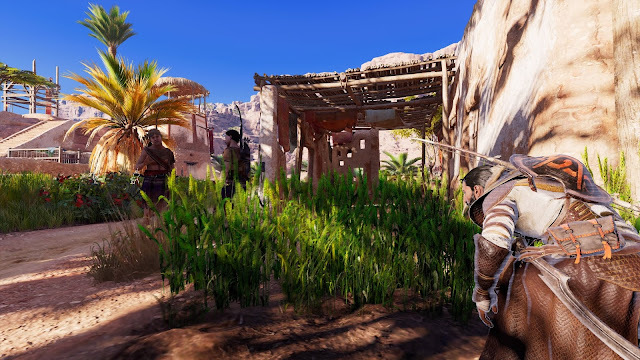 In some ways Origins feels like it’s that connecting point between Prince of Persia and Assassin’s Creed; it’s not a fantasy setting as the Prince’s world is, but it’s every bit as tantalisingly exotic. Finally, the microtransactions. They’re there, for sure, and this is certainly an irritation with blockbuster games that will not be going away anytime soon. For what it’s worth, however, they’re nowhere near as demanding or insistent as they were in that recent Lord of the Rings game, and I’ve never felt like I actually want to spend extra money on the stuff that’s on offer there. What I can say is that when new DLC comes in that offers additional stories and missions, I will be happy to make that investment, because I am completely invested in Origins. With any luck Ubisoft goes as far as to give us a substantial additional campaign with a different character, as it did with Freedom Cry and Adewale. Give us a new female protagonist in this period of history, Ubisoft, please. Related reading: Also well worthwhile on PlayStation 4 are the three Assassin's Creed Chronicles games. Matt's review of the first one. This is the best game in the Assassin’s Creed series. That extra year of development time has really helped Ubisoft find its creative centre again, and craft something that feels both fresh and energised. I could take or leave the shifts in gameplay to make this more like the loot-grind RPG-likes that dominate blockbuster game development, but when Ubisoft is playing so beautifully within a fascinating period of history, all I care about is how utterly engrossed I am with the storytelling.